Every year I have been at TISA past graduates return to say hello and let us know how they are getting on with their university studies. It makes me proud that they speak so warmly about their time as TISA students and I am particularly struck by their appreciation for the individualised support they received from their teachers. The teaching staff understand that you can only really personalise learning if you get to know the students in your classroom as individuals. Everyday I see evidence of how this provides the foundation to help students achieve. From taking action to support the work of charities here in Baku, to finding unique and creative solutions to the challenges they face in their studies, the students here at TISA inspire the teaching staff as much as we hope to inspire them. TISA is a special community where people really support each other. The staff, as a whole, care about the students and each other. I am very proud and grateful to work with fantastic teacher assistants in the primary school, who work so hard to support students. I have been at TISA for several years and a major reason for this is the calibre of my colleagues. I am inspired by what I can learn from them every day. The TISA faculty has a wealth of experience from around the world. This makes us open-minded and empathetic towards our students. This also gives us a very broad range of skills and experience to help us maintain high standards of teaching to engage students actively in learning every day. With such an international staff from around the globe the kids enjoy a great cultural diversity throughout their studies at TISA . They share more experiences with their peers and have an international awareness which is quite unique for children of this age. I am very glad of this, as our world is shrinking, and international tolerance and understanding is becoming of primary importance. TISA staff and faculty is a diverse and very motivated group. Most of my colleagues have lived and worked in different countries and bring a wealth of different experiences and knowledge to TISA. Not only do I enjoy working with them, but my children benefit from being taught by the teachers who have so much to share. Since TISA is an international school where students come and leave very often, I think one of the most special traits of its students is their capability to adapt to something new, to be welcoming and to put themselves in each others' shoes. There are many students willing to take the initiative to approach a new member of the community, to join a new sport or to participate on a play.In my opinion, the thrive to try new things and then putting maximum effort towards their achievement is what makes TISA's students special - they are able to communicate and be risk takers. As a result of these attributes, the friendships that you make in TISA are truly sincere and forever lasting. As someone who has been part of the community for 8 years I can confidently and proudly state that the student body at this school is as welcoming as it can get. Newcomers feel like they belong on their first day and leavers are always overwhelmed to leave their life behind all because of the supportive and warm atmosphere created by the students and teachers of TISA. There is no age hierarchy present, anyone can come to whoever, whenever and wherever for advice – people will always reach out and try to help or redirect to someone who can. The feeling of safety, confidence and the freedom to express oneself knowing that they won’t be judged and only appreciated creates a healthy environment in which one can learn and grow to their full potential. 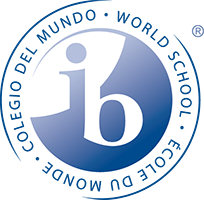 We are an IB World School and accredited by the Council of International Schools (CIS) and a member of the Central and Eastern European Schools Association (CEESA). TISA is authorised to offer the IB Primary Years Programme (PYP), Middle Years Programme (MYP) and Diploma Programme (DP). We are scheduled for a joint IB/CIS programme review and accreditation visit in the spring of 2018. The TISA Board of Governors has eight members: the Board Chairman is appointed by BP Regional President, and BP appoints at least two additional members. One is nominated by the US Embassy as well as one from the broader local business community as agreed by the Board. Two ex-officio members are elected to represent staff and parents, and the Director. Board members have considerable experience in a broad range of professional fields. The Board of Governors is responsible for protecting and ensuring the continued existence and future of the school. It sets the school’s strategy and establishes basic policies and major programmes. The Board delegates certain of its executive powers and duties to the Director to manage the school according to the Board’s policies. The relationship between the Board and the Director may be characterised as the split between strategy / policy and operations / administration. The Board limits itself to setting out the strategic direction of the school and to broad considerations of policy; the Director operates the school to implement the strategy and these policies. However, the Board of Governors retains the ultimate responsibility for the long-term viability and success of the school. The Board of Governors has clearly formulated policies set out in its comprehensive Board Policy Manual, a copy of which is available for consultation from the Director's Office. The Board meets monthly during term time, minutes are published to the community. The ongoing linkage between TISA and AIOC is maintained through the Board of Governors, whose Chair reports to the President of AIOC. The International School of Azerbaijan (TISA) opened in September of 1996 to serve the needs of the growing business and diplomatic community in Baku. The school is operated by the first oil consortium to begin operations in Azerbaijan, the AIOC (Azerbaijan International Operating Company). During the first two years of operations, the European Council of International Schools managed the School under contract with AIOC, and the school was located in the AIOC guesthouse on Nigar Rafibeyli Street in the city. From September of 1998 the School began operating as a department within AIOC, and later within BP-Amoco (now BP) when it became the single operator in June 1999. In January 1999, the school moved to the new site, purpose-built by AIOC and designed for 200 students in the residential Stonepay development on the edge of the city. Between 1999 and 2001, TISA went through an intense period of curriculum development and gained authorisation from the International Baccalaureate Organization (IBO) for each of the three IB Programmes: the Primary Years Programme (PYP), The Middle Years Programme (MYP) and the Diploma Programme (DP). In 2003, TISA was accredited by the Council of International Schools (CIS) and bid farewell to its first two graduates. In November of 2000, the introduction of an IB Diploma programme and increase in student numbers kick-started a second stage of primary construction funded by BP, Statoil and others. TISA 2 and 3 were completed between 2001 and 2006, adding classrooms, laboratories, a library and a dining/assembly hall, sufficient for a school of over 350 students. In 2007, TISA opened its Early Learning Centre (ELC), TISA 4, and absorbed TISA Nursery, designed to support our youngest learners. TISA is now well into the next chapter of its history, having recently celebrated its 20th birthday, joined the CEESA (Central and Eastern European Schools Association), and undertaken two major campus developments funded by BP: a TISA 5 Sports Complex and a Multipurpose Sports Pitch. TISA's collective priorities and ambitions for the years ahead are guided by the 2016-2020 Strategic Plan. In 2017, TISA has been licensed by the Ministry of Education of the Republic of Azerbaijan. TISA occupies a 5.9 hectare site on the outskirts of Baku, about 20 minutes from downtown Baku. The purpose-built facility is located in a residential community where many TISA families live. 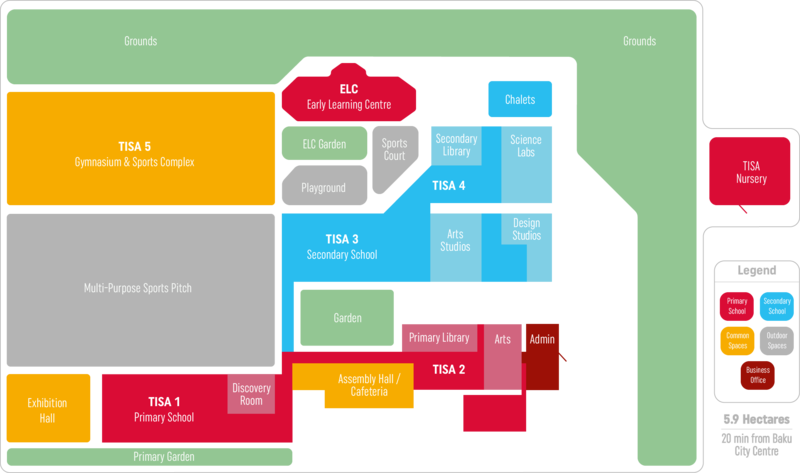 The Primary School classrooms and specialist areas are located in TISA 1 and 2 and in the Early Learning Centre (ELC). The Nursery for 2 year olds is located next to the main campus. Secondary School classrooms are in TISA 3 and 4 and a four-classroom annex, affectionately known as the ‘chalets’. Specialist rooms include science labs, libraries, art rooms, music and drama areas, a Design Technology Studio and resource areas. The lunch hall is also our assembly and main performance space. Outdoor facilities include play areas for all ages, a grass sports field and a basketball court. TISA 5 is an indoor sporting facility, which includes two full gymnasiums, a fitness room, climbing wall, dance studio and state of the art equipment.